I love to stroll through the Goizueta Gardens at the Atlanta History Center this time of year, and the more off the beaten path, the better. On a visit last weekend, I only had time to visit three of the Gardens—of many!—and was grateful for the respite. 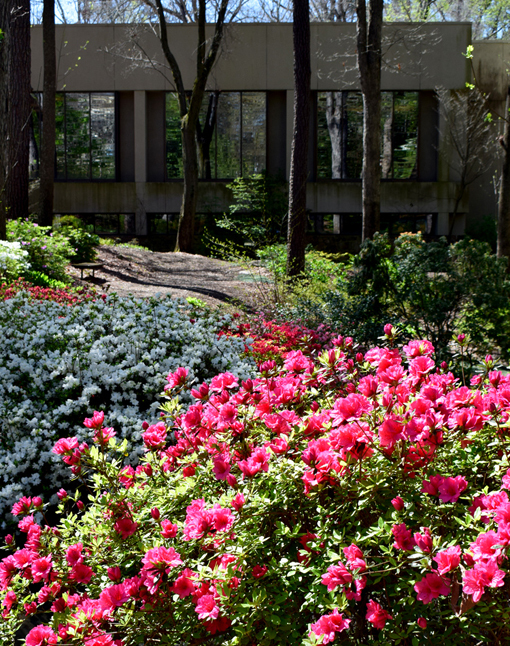 One of my favorite springtime destinations at the Atlanta History Center is the Frank A. Smith Memorial Rhododendron Garden. The swaths of bright colors this time of year makes it beautiful, yet, a less traveled garden, it's also serene. The access path isn't blatantly obvious—one of the aspects that keeps it so serene, I think. It's to the right of the Kenan Research Center (pictured above), which I've visited a number of times in the last several months doing...research. There's usually a fascinating exhibit in this building, too, and it's where the Center's oral histories are recorded, for their Veterans History Project. 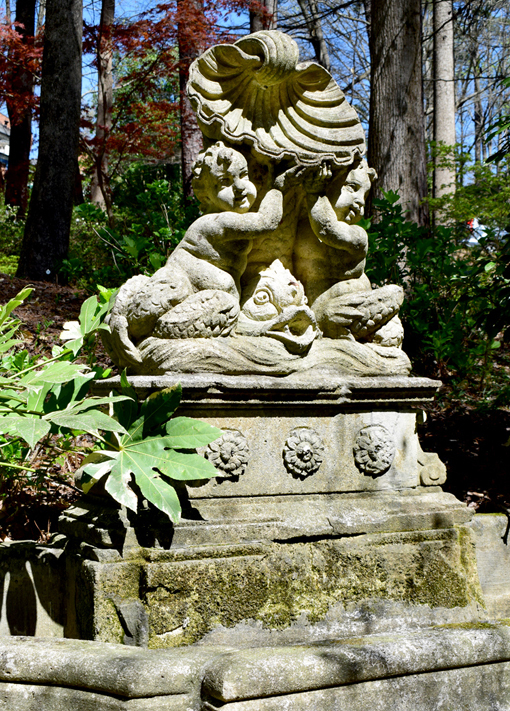 The Sims Asian Garden is equally serene and peppered with statuary. Some of the flora you might see here include gardenias, evergreen azaleas, and Japanese maples. Not all the "fauna" is scurrying about, including the bewildered-looking turtle pictured above. At the end of the Sims Asian Garden, traveling from the Kenan Research Center, you'll find yourself at the front driveway of the Swan House. You can walk toward the Swan House to continue your exploration of the 33-acre campus, just be mindful that you're not crashing a wedding taking place on the Swan House lawn! On the Swan Woods Trail you'll find an historic first. On Sunday, April 17, 1988, this portion of the Atlanta History Center's gardens was designated a Garden of Peace, the first in a global network of gardens for contemplation and meditation. 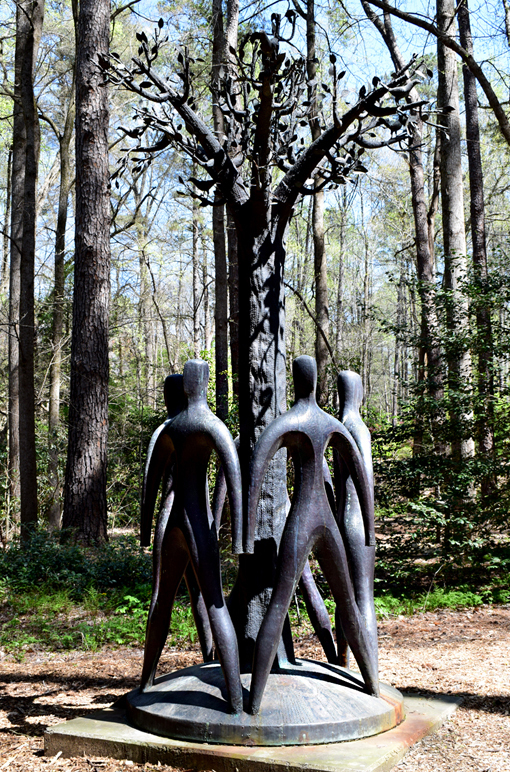 "The Peace Tree", a 14-foot bronze sculpture by Soviet artist Georgi "Gia" Japaridze, was part of an art exchange with the city of Tbilisi, Georgia, Atlanta's sister city in the former Soviet Republic of Georgia. The sculpture was dedicated on Sunday, September 24, 1989, with the mayor of Tbilisi in attendance. 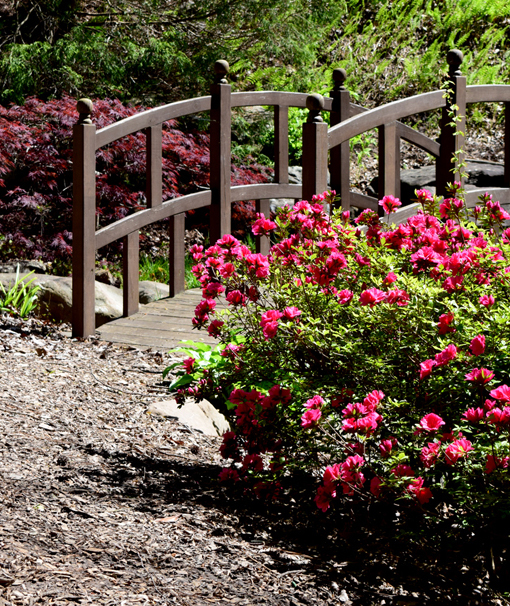 The next time you visit the Atlanta History Center, I encourage you to explore the Goizueta Gardens...all of them! I've only touched on a few here and, as you can see, have only scratched the surface. 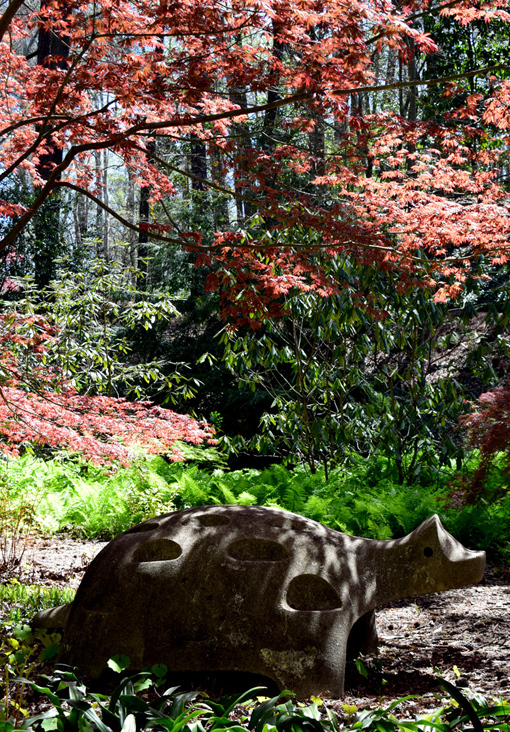 Its Atlanta's best kept secret garden! In the heart of Buckhead- 33 acres that make you forget you're in the middle of a giant city. A preserved Country Place Era home and gardens, a preserved yeoman farm (with authentic historic breeds of animals and heirloom crops), a real settlers cabin and wildflower meadow, 10 acres of preserved woods... all with a sweet brook running through it and interesting objects dotting the landscape. Pretty cool! The staff outside know their stuff and love to share their knowledge.